I don’t know what I expected from The Weight of Things, but what I got was something entirely unexpected and powerful. I feel ashamed that this is the first time I’ve read Marianne Fritz. It seems, somehow, sadly entirely typical that a body of work written in a language other than English and by a woman, should remain outside of the canon of someone, like me, who has spent my entire adulthood studying, reading and writing literature. If this is how it is now, how will it be when we move further from Europe? More than ever, the work of the translator is essential. We need to hear voices that don’t speak quite like our own. 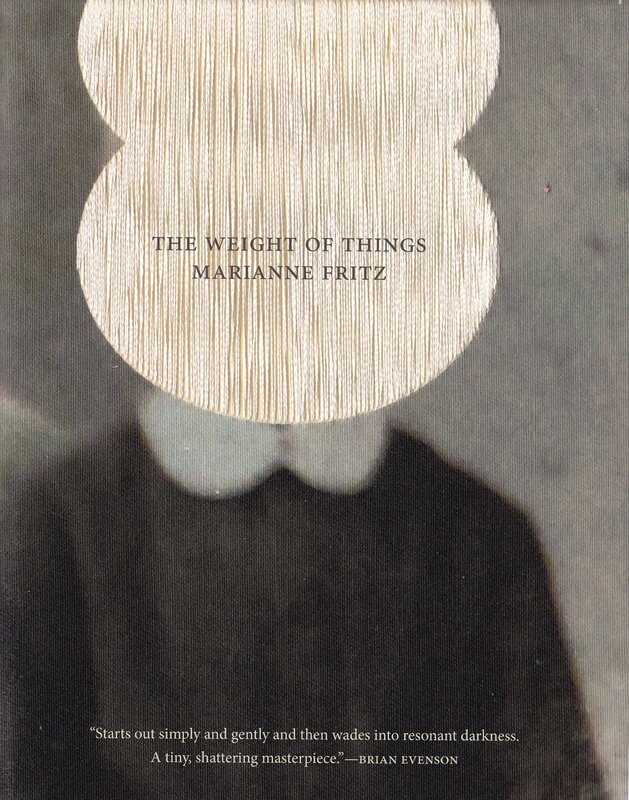 The Weight of Things was the first published book of the Austrian author, Marianne Fritz, who has been called by some a female Joyce – an ambiguous accolade. Apparently, her work after The Weight of Things becomes untranslatable as it fleshes out into diagrams, maps, paragraphs created around single letters, manuscripts so complex they were printed direct from the original copies. The thought is an enticing one for me and leads to a further sense of shame in my own lack of linguistic ability. To return to the work in hand, The Weight of Things is a slight volume that eases you in with a portrait of an embattled marriage only to take you into the heart of a world weighed down by thought and reflection. So intense is Berta’s contemplation of her children and her desire for them to be unburdened of her and the difficulties of making one’s way in the world, that unending sleep seems their only option and she the only one who can take them there. It is painful to read of her longing to give her children joy, to bring them up with a sense of carefree happiness, only to feel that she has failed over and again. It is a picture of motherhood that needs expression and it is unsurprising that she is fixated with the perfect image of the mother in Mary, the Madonna, whose unlined features so mirror those of her daughter when she sleeps. It saddens me that a novel originally published in 1978 feels so relevant. Poor Berta is confined to a madhouse and the embattled couple who lead us into the story of Berta’s life, come to visit her in order for her old and undermining friend, Wilhelmine, to take the final, victorious step over her old friend by showing her that she not only now has her husband, but should also rightfully own the Madonna necklace he once gave to her all those years ago. ‘ “… The weight of things. The weight of things. Did you forget it? She watches what they do but has no power to help them, no voice. Her husband is away so without anyone to care for them, they leave the house only when desperate with hunger and raid dustbins for food, fighting with dogs over bones. Edicts are put up outside their building about vagrants, and then about the corpse that must not be buried but will soon be sealed within the apartment ‘to keep the stench of rot inside’ (p87). Her husband comes to entomb the corpse, not knowing it is Berta, leaving the children there in a mistaken understanding that she can look after them until he returns from his work trip. Eventually the children eat her rotting flesh and when her husband hears the strange scrapings of their wasted bodies, he is able to persuade himself he hears nothing and wanders away wondering vaguely where they could be, refocusing his attention on the more pressing matter of his work. The Weight of Things has profound clarity. Though reality, the weight of things, presses against the characters, forcing the surreal into the day-to-day, there is an insistence on the power of words and their ability to force people to labour under them. Aunt Wilhelmine labels Berta as a disaster and her children as dumb. The teachers give her children the label of special needs. These labels are then embodied by the characters, imprinting the kind of sentence of Kafka’s penal colony, making the children blame their mother for their failings and Berta blame herself. This is the kind of book you want to return to often and may not need to turn the pages of the actual book because the scenes you wish to see have been carefully etched into your mind. I thoroughly recommend it. This week I’m be reading The Visitor by Maeve Brennan.